The Purple Scarf: Exhibit: Visiting Ai Weiwei's World?! Heya! Last week I visited one of the Art Gallery of Ontario's latest exhibitions: Ai Weiwei: According to What? And I have to say I was moved, shocked, and marveled at the magnificence and bravery of this Chinese dissident artist. ArtReview called Ai Weiwei "The most powerful figure in Contemporary Art", and after visiting this exhibition, I can see why. Through photography, video, sculpture, and installation art, the artist examines the complexities of the changing (and unchanging) world and focuses on issues such as human rights, freedom of expression, and political oppression. Through using materials from the past, such as a wood salvaged from a Qing Dynasty temple, or from national tragedies, like rebal bars taken from the rubble of schools destroyed in the 2008 earthquake, Ai Weiwei creates amazing, beautiful and thought provoking pieces. And among all this amazing art, on a large white wall, lists in bold black writing, all the names (or all the names Ai Weiwei and team could find) of the over 5000 school children who died in the 2008 earthquake, due to substandard and unregulated buildings. Ai Weiwei first came to the international media's attention when he spoke out publicly against the government pushing people out of their city for the 2008 Beijing Olympics. What made his speaking out more profound, was that Ai Weiwei was the consulting artist for The Birds Nest Olympic Stadium. Ai Weiwei began to speak out more and more against the Communist government in China, especially in the aftermath of the 2008 earthquake that killed over 80 000 people, and how the government refused to release names and the numbers of those that lost their lives. Because of his views and and opposition aginst the Chinese government, Ai Weiwei, has been brutally beaten ( a photograph of his brain hemorrhage from a beating by police officers is on display), jailed on trumped up charges, his passport taken away, his Studio destroyed, and he was put on house arrest. He is not allowed to leave China, yet his art and message crosses all borders and language barriers and speaks to all those that can and will listen. And P.s! 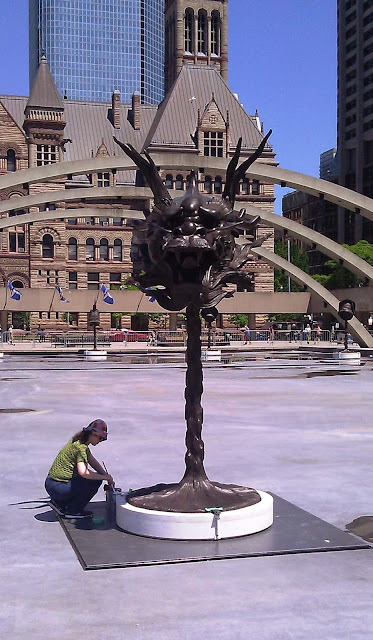 : You may have seen some of Ai Weiwei's amazing artwork: The Circle of Animals/Zodiac Heads was on display at Nathan Philips Square from June 18 -September 22, 2013. 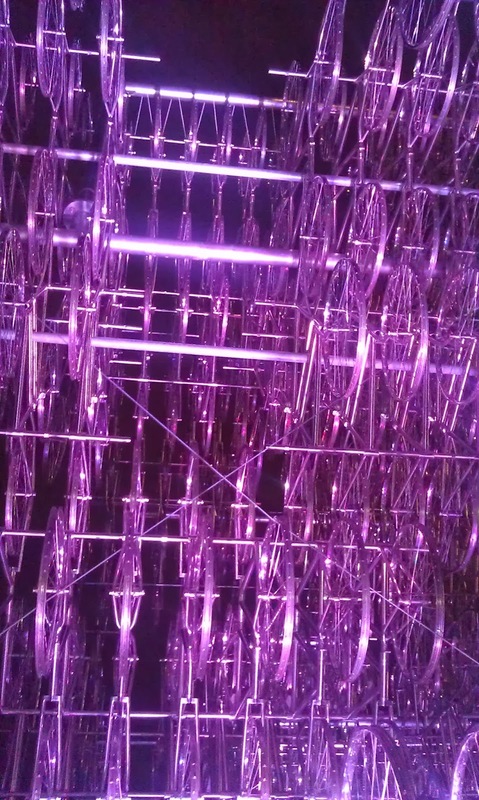 He also participated in this years Nuit Blanche and created the Forever Bicycles sculpture at Nathan Phillips Square, that can still be visited until October 27th, 2013. (Read my post on Nuit Blanche here). Both of these installations were/are free!